I invite everyone to celebrate Earth Day today. Observing our home is at the core of NASA’s mission, and it continues be a dynamic and growing area of our activity. A ‘Blue Marble’ image of the Earth taken from the VIIRS instrument aboard NASA’s most recently launched Earth-observing satellite – Suomi NPP. 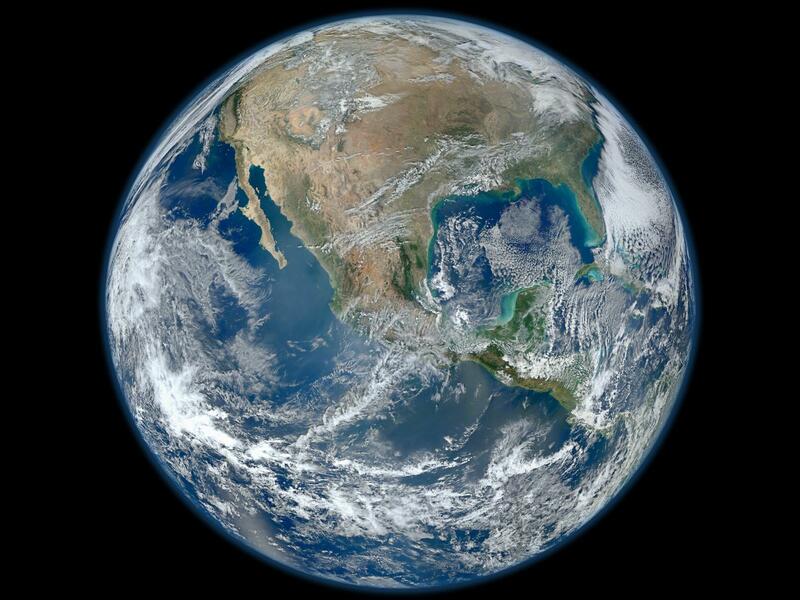 This composite image uses a number of swaths of the Earth’s surface taken on January 4, 2012. The NPP satellite was renamed ‘Suomi NPP’ on January 24, 2012 to honor the late Verner E. Suomi of the University of Wisconsin. Suomi NPP is NASA’s next Earth-observing research satellite. It is the first of a new generation of satellites that will observe many facets of our changing Earth. Suomi NPP is carrying five instruments on board. The biggest and most important instrument is The Visible/Infrared Imager Radiometer Suite or VIIRS. Living in space is going to be part of our future, but what we know about Earth and how we live on this planet is absolutely critical. That’s one reason I was so pleased that this past year NASA launched five Earth new observation missions, including sending instruments to the International Space Station that are adding to its capabilities as a platform for Earth science in addition to what it helps us learn about human health in space. We want to know how our planet works, how we affect it, and how it might change in the future. Right now, including those recent launches, NASA has 20 spacecraft orbiting Earth and gathering amazing science data. They can see carbon dioxide in the air, water reserves below ground, the heat our planet is absorbing, and the inside of hurricanes — Amazing stuff! This is the first time in human history that we can really see and hope to understand how a planet lives and breathes. It’s a tall order, but NASA is on it. With this knowledge we are able to tackle one of the biggest challenges facing everyone on Earth today: Climate Change. Because we have these incredible tools in space, we can now see the changes across the whole planet. We can see the facts. We don’t have all the answers yet, but we’re making progress. We are steadily increasing the known, and decreasing the unknown about how Earth is changing. Knowledge is a powerful tool, and with it we can all be better stewards of our home planet. This Earth Day all of you have the opportunity to become Earth observers. We want everyone to stop for a moment this April 22 and share their photos and videos of favorite places they’ve been using the hashtag #NoPlaceLikeHome. We’ll be posting NASA’s best shots from space (including some of my favorites from my “old days” in shuttle) to send the message that there really is no place like our home planet. We all love Earth, so let’s be more observant of it. Let’s learn more about it and NASA will keep circling the globe to help us all protect it and work toward a brighter future. This mission is part of the critical roadmap we’ve been undertaking with bipartisan support since the President challenged us five years ago to plan for a human mission to an asteroid and later to Mars. 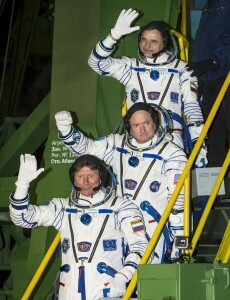 When American astronaut Scott Kelly is in space, he’ll not only carry out the research and technology demonstrations that our astronauts have been helping us develop during the past 14 years of continuous human habitation aboard the International Space Station (ISS), he’ll also participate in a unique experiment. Scott has an identical twin brother, Mark – also an astronaut – who will be here on Earth. We’ll compare the brothers’ vital signs and learn how space affects the human body on orbit. Throughout Scott’s mission we’ll gain new, detailed insights on ways long-duration spaceflight can affect things like bone density, muscle mass, strength, vision and other aspects of human physiology. We’ll also look at mental changes and challenges astronauts may face when they embark on longer-duration missions. We will also get an opportunity to see how microgravity affects the human genome. This information might affect every one of us on Earth as we get a unique insight into genomic changes. Unfortunately, Scott won’t launch on this important mission from the United States on an American spacecraft. However, that’s not for a lack of trying on the part of the Obama Administration. 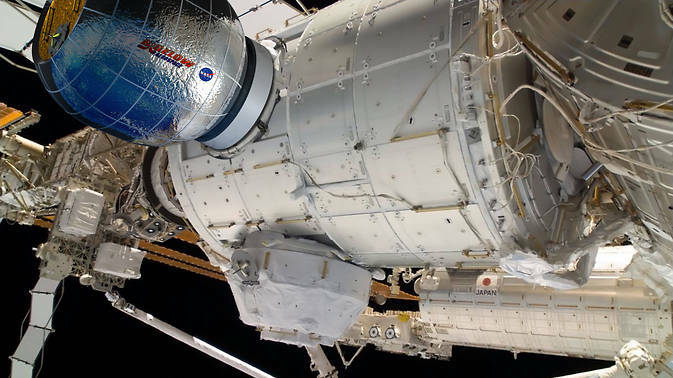 Five years ago, the President laid out a plan to ensure we had an American system to transport our astronauts to the International Space Station once the Bush Administration’s plan to retire the Space Shuttle went into effect. That plan looked to the ingenuity of U.S. industry to develop private space transportation systems to get crews to the ISS. Regrettably, Congress did not fully fund this plan and delayed its implementation until 2017. It is my hope that the plan is fully funded this year, as full funding this year is critical to ending our sole dependence on the Russians as soon as possible. Kelly’s launch is one key aspect of NASA’s efforts to meet the President’s goal of a human mission to Mars, but much work is underway throughout the agency to meet this vision. Technology drives exploration and NASA has integrated its work to focus on developing the technologies to reach deeper into space. Our Space Launch System rocket, which will be the most powerful ever built, has moved from being a concept into development. Just this month we’ve tested the booster and the rocket engines for this powerful vehicle. The Orion spacecraft, in which astronauts will travel to farther destinations in deep space, performed flawlessly on its first flight test in December. We have completed the first round of detailed reviews and are now looking even closer at the heat shield through destructive evaluation. This data review will help us improve Orion’s safety and performance as we prepare for a crewed flight. We’re also working on the advanced technologies for propulsion, landing and radiation shielding, among many others, that humans will need to travel farther than we ever have before. While that work is rapidly advancing, our commercial partners’ innovation will make it possible for the next generation of astronauts to travel once again to space on American systems. We couldn’t be more proud of our astronaut corps, our innovative engineers and scientists and the industrial gumption of our partners. Together, they’re helping to create a whole new segment of the economy that is driving the inspiration and competitiveness of the future. Scott Kelly’s launch is more than simply one person’s journey to the International Space Station. At the end of his mission, he will become the record holder for longest stay in space by an American. But as he works off the Earth, for the Earth, he stands on the shoulders of the great NASA achievements that made the Space Station possible. He is helping us reach higher and take those next great leaps in exploration. His historic mission is one more sign that our nation’s space program is thriving and continues to lead the world. On Saturday, we kicked off the New Year in a spectacular way. SpaceX launched its latest cargo resupply mission to the International Space Station (ISS), the first American commercial flight to the ISS in 2015. This morning, the Dragon capsule arrived at the orbiting laboratory with more than two tons of supplies and science investigations for the crew in orbit. Our investment in commercial space is bringing tangible benefits to the American people and enables NASA to focus on future missions to deep space – to asteroids and Mars. Thanks to SpaceX and Orbital Sciences – our two commercial cargo partners – we’ve returned Space Station resupply launches to U.S. soil. We’re now poised to do the same with the transport of our astronauts to the space station by SpaceX and The Boeing Company in the coming years – targeting 2017 as the inaugural year for commercial crew missions. 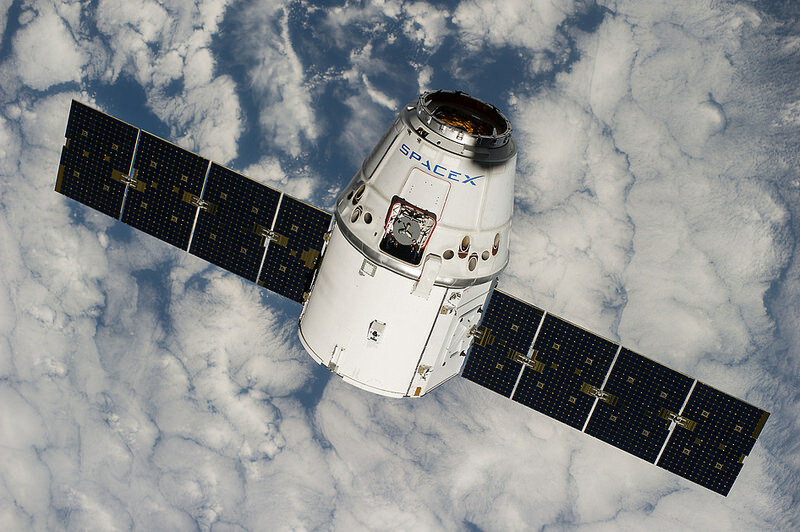 Today’s arrival of the SpaceX Dragon spacecraft not only resupplies the Station, but also delivers important science experiments and increases the Station’s unique capabilities as a platform for Earth science with the delivery of the Cloud-Aerosol Transport System, or CATS, instrument. This launch also illustrates how SpaceX recognizes that technology drives exploration. The company has made great strides in returning first stage elements to a barge positioned down range. Being able to return a launch vehicle in a controlled manner back to Earth right now is another example of how technology can inform launch capabilities. As we set our sights on 2017, we’re looking forward to working with Boeing and SpaceX on the renewed capability to launch American astronauts from U.S. soil, ending our nation’s sole reliance on Russia for such transportation. I congratulate the SpaceX and NASA teams who made Saturday’s success possible. We look forward to extending our efforts in commercial space to include commercial crew transport to the Space Station by 2017 and to more significant milestones this year on our journey to Mars. With the holidays fast approaching, our nation’s airlines and air traffic control system are gearing up for the busiest time of the year for air travel. The industry association, Airlines for America, predicts 24.6 million passengers will take off to visit friends and family during the upcoming Thanksgiving Day weekend, up 1.5 percent from 2013. Sunday, Nov. 30, will be the busiest day of the year at U.S. airports. Thanks to advancements in aeronautics developed by NASA, today’s aviation industry is better equipped than ever to safely and efficiently transport all those passengers to their destinations. In fact, every U.S. aircraft flying today has NASA-developed technology incorporated into it in one way or another. Streamlined aircraft bodies, quieter jet engines, techniques for preventing icing, drag-reducing winglets, lightweight composite structures, and so much more are an everyday part of flying thanks to NASA research that traces its origins back to the earliest days of aviation. The same is true at Federal Aviation Administration facilities where movement of passengers and cargo through the National Airspace System is closely monitored and managed. Today’s air traffic controllers rely on NASA-developed procedures and computer software tools designed to reduce congestion and increase efficiency on the ground and in the sky. A great example of that is something we’re working on right now with American Airlines and the FAA called Dynamic Weather Routes, or DWR. It’s a computer software tool that helps airlines find better routes to fly around bad weather while their airplane is already in the sky and on its way. Tests so far already show promise the tool can help save money in fuel costs and reduce delays for passengers. All of us at NASA can be proud of our ongoing role in enabling aeronautical innovation and ingenuity, a research heritage that goes back 100 years to the formation in 1915 of the National Advisory Committee for Aeronautics (NACA). March 3, 2015, marks the centenary of this occasion. Subsequent research by the NACA’s engineers at its world-class laboratories and wind tunnels in Virginia, California and Ohio led to fundamental advances in aeronautics that enabled victory in World War II, propelled supersonic flight, supported national security during the Cold War, and laid the foundation for the space age with NASA’s creation in 1958. During the next year – as we celebrate the NACA centennial and our heritage of excellence in aviation research, our aeronautical innovators are continuing to identify ever more complex problems in aviation, while also designing and testing practical solutions using ever more sophisticated tools. Our focus continues to be designing new aircraft and engines that burn less fuel, operate more quietly and generate fewer emissions. At the same time, working with our industry and government partners, NASA will also continue to improve and modernize the nation’s air traffic control system so it can safely handle the colossal influx of additional air traffic expected in the future. We know how important aviation is to all of us. Our economy depends on it. Passenger travel and cargo shipments generate more than $1.5 trillion in activity while supporting more than 11.5 million jobs. And it’s true that aviation touches all of us every day, whether flying to an important business meeting, visiting loved ones, or even taking overnight delivery of a brand new smart phone. It is important to remember: at every step along the way; inside cockpits, cabins and jet engines; atop traffic control towers; and from departure gate to arrival terminal at airports everywhere, the DNA of the entire aviation industry is infused with technology that has its roots in NASA research. NASA is with you when you fly. At NASA, we have a unique perspective on Earth. Every day, we observe its grandeur from our International Space Station orbiting 250 miles above the planet and capture a wealth of scientific data about how our planet is changing from our fleet of Earth observing satellites. This year, with the launch of five Earth-observing missions — more Earth-focused launches in a single 12-month period than we’ve had in more than a decade — NASA will be able to deliver even more crucial data to scientists trying to understand our changing planet. Back on Earth, we can’t escape the impact of climate change on our facilities and operations. Last week, we released our annual Sustainability Report and our Climate Change Adaption Plans, which detail the steps NASA is taking to reduce carbon emissions, save energy and cut costs for the American taxpayer; as well as a review of the key challenges we face as a result of climate change. The reports confirm that NASA’s critical launch pads and other facilities are vulnerable to beach erosion; currently, 66 percent of our assets are within 16 feet of sea level located along America’s coasts. This threat will only increase as sea levels rise and storm intensity increases. Electrical black-outs and brown-outs associated with heat waves threaten energy utilities that provide power NASA uses to receive and process data from space. Rocket engine testing at Stennis Space Center depends on surrounding forests to buffer the noise and vibrations from testing, which requires a constant evaluation of our climate resilience. That’s why we believe it is so important to steward our agency’s use of natural resources and to plan for future mitigation of the impacts of a changing climate. Our 2014 Strategic Sustainability Performance Plan examines eleven goals including fleet management, greenhouse gas reduction, and climate change resilience and pollution prevention. It shows that in 2013, NASA made significant progress on sustainability measures. For example, we surpassed our petroleum reduction and alternative fuel usage goals, reducing use of petroleum by nearly 37 percent last year, while increasing use of alternative fuels 297 percent over 2005 benchmarks. NASA is also focusing on the security of our energy and water supplies. Since 2010, we’ve reduced the amount of water we’ve used for industrial, landscaping and agricultural purposes by 70 percent. NASA developed an Energy Security Plan (ESP) template to provide Centers with a guideline to generate their energy/water security plans based on their local conditions. Stewards at NASA Centers are evaluating risks, proposing adaptation strategies, and integrating strategies into existing management plans. Through our management of climate risks and incorporation of sustainability principles into operations and planning, NASA is a resilient enterprise in service to the nation. We will continue to provide stellar research that improves our knowledge of earth science, including data and analyses to better understand climate systems. Today, with the selection of Boeing and SpaceX to be the first American companies to launch our astronauts to the International Space Station, NASA has set the stage for what promises to be the most ambitious and exciting chapter in the history of human space flight. From day one, the Obama Administration has made it clear that the greatest nation on Earth should not be dependent on other nations to get into space. Thanks to the leadership of President Obama and the hard work of our NASA and industry teams, today we are one step closer to launching our astronauts from U.S. soil on American spacecraft and ending the nation’s sole reliance on Russia by 2017. Turning over low-Earth orbit transportation to private industry also will allow NASA to focus on an even more ambitious mission – sending humans to Mars. We have already fulfilled part of the President’s vision. For the past two years, two companies, SpaceX and Orbital Sciences, have been making regular cargo deliveries to the International Space Station. The contracts we are announcing today are designed to complete the NASA certification for human space transportation systems capable of carrying people into orbit. Once certification is complete, NASA plans to use these systems to ferry astronauts to the International Space Station and return them safely to Earth. Again, this will fulfill the commitment President Obama made to return human spaceflight launches to U.S. soil and end our sole reliance on the Russians. As a former space shuttle commander, I know that the goal of every mission is to do something different from the flights that have gone before. Alan Shepard earned the title first American in space, John Glenn the first American to orbit Earth. And with all due respect to the late Michael Jackson, Neil and Buzz were the first moonwalkers. Today, we don’t know who is going to get to command the first mission to carry humans into low-Earth orbit on a spacecraft built by an American private company, but we know it will be a seminal moment in NASA history and a major achievement for our nation. We now know, however, who will build it. The Boeing Company (Boeing) and Space Exploration Technologies (SpaceX) have each presented to us designs that will allow us to fly crews to the International Space Station in just a few years. Respectively, the vehicles are Boeing’s CST-100 and SpaceX’s Dragon. The total potential contract value is $4.2 billion for Boeing and $2.6 billion for SpaceX. The spacecraft will launch from Kennedy Space Center – Cape Canaveral complex. Our specialist teams have watched the development of these new spacecraft during earlier development phases, and are confident they will meet the demands of these important missions. We also are confident they will be safe for NASA astronauts – to achieve NASA certification in 2017, they must meet the same rigorous safety standards we had for the Space Shuttle Program. It was not an easy choice, but it is the best choice for NASA and the nation. We received numerous proposals from companies throughout the aerospace industry. 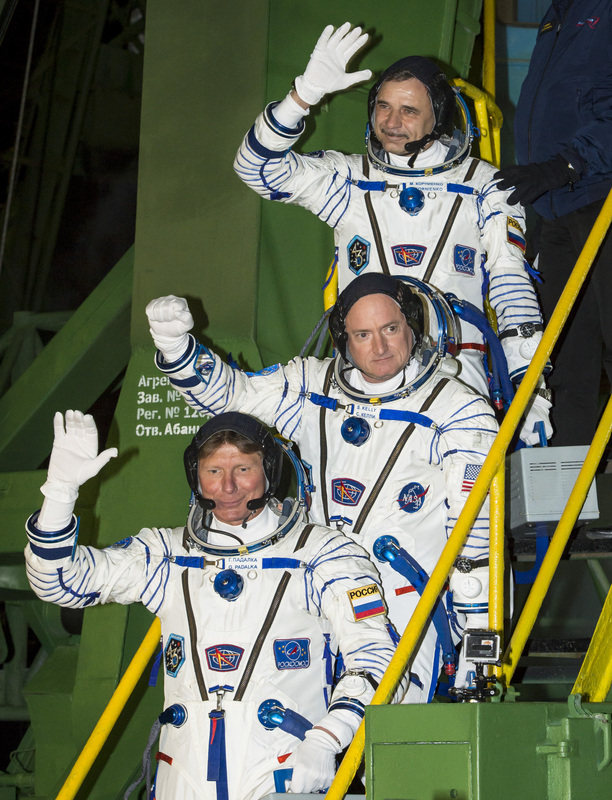 Highly qualified, American companies – united in their desire to return human spaceflight launches to U.S. soil – competed to serve this nation and end our reliance on Russia. I applaud them all for their innovations, their hard work and their patriotism. The partnership with Boeing and SpaceX promises to give more people in America and around the world the opportunity to experience the wonder and exhilaration of spaceflight – to realize the dream of leaving Earth for even a short time to float above our planet Earth in microgravity and to see the stars and the majestic tapestry of the Milky Way unobstructed by the artificial lights and dust of our atmosphere. Space travelers also will be able to imagine and realize new benefits that can be brought back to Earth. While Boeing and SpaceX handle the task of taking our astronauts to the space station, the scientists on Earth and astronauts on the orbiting ISS National Laboratory will continue the groundbreaking research that has been taking place there for almost 14 years now without interruption. They will be able to add to that portfolio with an expanded crew made possible by the arrival of these new spacecraft. As research takes place in Earth orbit and the companies refine these new space transportation systems, we at NASA will be working just as diligently readying our new heavy-lift rocket, the Space Launch System (SLS), and our multi-purpose crew vehicle, Orion, for missions in the next decade that will carry people far from our local space neighborhood. Just yesterday, off the coast of California, I witnessed the successful recovery test of the Orion engineering test article – the next generation spacecraft that is being readied for its December flight test and its eventual use for journeys to an asteroid and to Mars. With the help of the U.S. Navy, the Orion mockup was put through a full ocean recovery dress rehearsal. Following its first flight (EFT-1), Orion will splashdown in the Pacific Ocean – the first time in more than 40 years that it has been necessary to recover a human spacecraft from the ocean. Last week, at Kennedy Space Center, we rolled the Orion crew module for EFT-1 out of the Neil Armstrong O&C Building to the Hypergolic Processing Facility for fueling in preparation for its maiden test flight in December. Just two days later at NASA’s Michoud Assembly Facility in New Orleans, we cut the ribbon on the new 170 foot high Vertical Assembly Center, the state of the art tooling facility that will weld together the massive core stage of the SLS – the rocket that will launch Orion and our astronauts farther into space than any human has gone before. From Michoud, I traveled to the Stennis Space Center to view progress on the historic B-2 Test Stand that is being prepared to test the core stage of SLS and its configuration of four RS-25 engines. We will launch SLS and Orion from Kennedy Space Center. They will test the systems needed to get to Mars – with missions to an asteroid and areas beyond the moon such as Lagrange points, where space observatories will be operating within our reach in the 2020s as we conduct the first deep space mission with astronauts since the Apollo moon landings. We’ll conduct missions that will each set their own impressive roster of firsts. 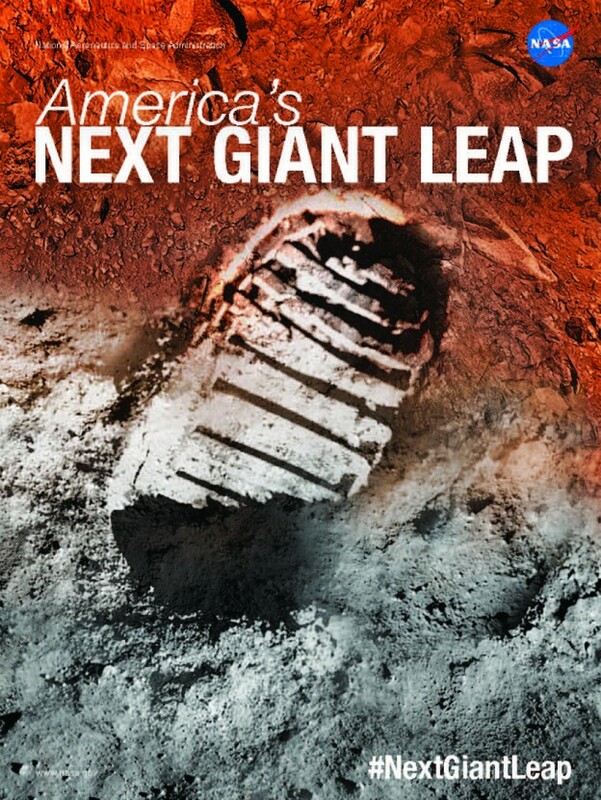 First crew to visit and take samples of an asteroid, first crew to fly beyond the orbit of the moon, perhaps the first crew to grow its own food in space — all of which will set us up for humanity’s next giant leap: the first crew to touch down and take steps on the surface of Mars. Our destiny is set. Our course is laid out before us. And we are following it. We hope the American people will be inspired to join us on this next great, ambitious leg of humanity’s journey farther into our solar system than ever before. Today the NASA family celebrates National Aviation Day, which was established in 1939 on the birthday of Orville Wright, the aviation legend who made that historic first flight at Kitty Hawk in 1903. Since those early days of open air cockpits and fabric-covered airplanes, aviation has grown to become a critical component of our daily lives, no matter where we are in the world. Aviation enables us to stay connected with family and friends across the globe, and it has a major influence on our economy. The spirit of the Wright Brothers’ pioneering work continues at NASA as our aeronautical innovators seek to drive technological breakthroughs that make aviation more fuel-efficient, and that reduce aircraft noise and noxious emissions. Today we’re looking at how aviation fits into the big picture of global economic and population expansion, and how we can take advantage of technological innovation in areas not traditionally associated with aviation. NASA Aeronautics has developed an exciting new strategic vision that clearly focuses our research on priority challenges in order to benefit society and our nation’s economy. Technologies we’ve worked on recently include Precision Departure Release Capability, a software tool we transferred to the FAA last year. It identifies precisely when an aircraft needs to push back from an airport gate in order to make its slot in the overhead stream of traffic on time, improving traffic flow and saving fuel. We’re also setting up a round of field tests for Dynamic Weather Routing, a tool that continually analyzes flight trajectories and weather conditions, and then suggests course corrections to avoid trouble and reduce delays. Efficient Descent Advisor – another tool transferred to the FAA — has the potential to reduce local noise and emissions pollution, reduce flight time and save $300 million per year in wasted jet fuel. Still other technologies continue to be developed. For example, NASA will be on board a Boeing 787 ecoDemonstrator aircraft this fall to flight test a technology designed to improve airborne spacing, and on a Boeing 757 ecoDemonstrator next year to test new ideas for reducing drag and improving fuel efficiency. Making aviation greener for the long term is a major focus of our aeronautics research strategic vision, and we’re also continuing to lead research in documenting whether aircraft biofuels actually reduce emissions. (Preliminary results indicate they do). As always, we’re looking to advance the state of the art in everything we do. Another key initiative we’re working on is to help bring back supersonic passenger flight by increasing our understanding of how to create quieter sonic booms. Our work could lead to new designs that alter how sonic booms are made by aircraft so that people on the ground might not even notice. All of these innovations directly affect travelers and commerce worldwide. The President’s FY15 budget proposal sets the stage for NASA to continue our innovative work as we tackle the global challenges facing aviation as laid out in the strategic vision. This Aviation Day, please join me in saluting our aeronautics researchers and the critical work they do. Take a look at some great photos in a special Flickr album we’ve put together for this day. In the spirit of Orville Wright, use social media to tell us about your first flight experience. What kind of airplane were you on? Where were you going? Did anything about the flight surprise you? Use the hashtag #myfirstflight. Visit a local aviation museum. Or say “thanks” to someone who works in aviation as you embark on a trip. We can all look forward to continued advances in Aeronautics, the first “A” in NASA — because NASA is with you when you fly, today and into the future. When we say that small business is big business here at NASA, it’s not a slogan, it’s ingrained in our culture. I am especially proud of NASA’s record of support for small businesses, which is essential to our achievements in space and here on Earth. Which is why I was so pleased today to join Small Business Administration head Maria Contreras-Sweet at an event unveiling our nation’s federal procurement scorecard for this past year, FY2013. The scorecard outlines our progress toward using small business to achieve our nation’s goals in many areas. NASA’s SBA Scorecard has moved from “C” to “A” in just three years. We’re not perfect, and in some areas we have a ways to go, especially in meeting our goals with Women-Owned, HUBZone, and Service-Disabled Veteran-Owned small businesses, but we’re headed the right direction. After all, we’re NASA – we’re in the business of shooting for the stars – and learning along the way how we can improve and get better. Small businesses are the backbone of the American economy. They employ about half of all private sector employees. They account for 42% of the total U.S. private payroll and they are incubators of innovation, developing new products and new ways of solving problems that are benefiting communities nationwide and maintaining America’s leadership in the global economy. This is the first time in 9 years the federal government exceeded the overall 23% goal for small business procurement. I commend the Obama Administration for its commitment to small business and for recognizing how crucial these entrepreneurs are to the health of our economy and for creating new jobs. At NASA, we also take our commitment to small business very seriously, and I pledge to continue working diligently toward all of our goals. I want to thank and commend Administrator Contreras-Sweet for her dedication and commitment to small businesses –for her work to keep this vital engine of our economy moving forward. NASA is on a journey to Mars and there are already small businesses there supporting various aspects of the Curiosity rover. As we implement our stepping stone approach to more challenging missions, eventually sending humans to the Red Planet, I know small businesses will be with us all along the way.